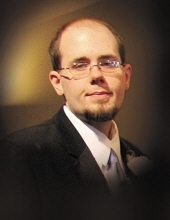 Scott M. Schroeder, age 33, of Lomira, passed away at home on Sunday, November 25, 2018. He was born on June 15, 1985 in Milwaukee to parents Leonard and Debra (Cooper) Schroeder. Scott was a 2004 graduate of Milwaukee Hamilton High School. Scott is survived by his parents; brother, Steven (Amber); grandparents, Doris and Rudy Bobinger; aunts, Linda (David Sr.) Saegert, Bonnie (Randy) Caves, Peggy (Gary) Burke and Pam (Jerry) Bobinger-Rossetti; uncles, Mike (Lauren) Cooper, Randy (Mary) Bobinger and Delmar (Barbara) Schroeder; he is also survived by other relatives and friends. Scott is preceded in death by grandparents, Charles and Sylvia Schroeder and George Cooper. Funeral Services for Scott will be held at the Shimon Funeral Home, 824 Union St., Hartford on Friday, December 7, at 5:00 PM. Visitation for family and friends from 3:00 PM until time of service. To send flowers or a remembrance gift to the family of Scott M. Schroeder, please visit our Tribute Store. "Email Address" would like to share the life celebration of Scott M. Schroeder. Click on the "link" to go to share a favorite memory or leave a condolence message for the family.